As early as the 1400s the village of Findochty crowded around the natural harbour known as Crooked Haven. In 1568 the Ord family acquired the “manor, port, custom and fishers’ lands” of Findochty, and later built the castle, now a sorry ruin, which stands just west of the village. 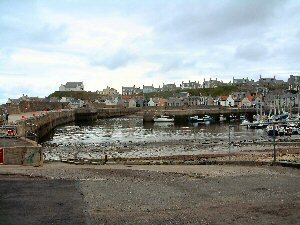 In 1716 the Ords brought thirteen men and four boys from Fraserburgh under contract to fish from Findochty, and for a time the harbour was busy with landings of herring and white fish. It expanded as a fishing port through the 1700s and 1800s, and by 1850 was home to 140 fishing boats. But the expansion in the late 1800s of nearby Buckie provided a better harbour, and the fishing fleet had left Findochty by 1890. Today the fishing boats have moved to larger harbours, and Findochty harbour is used mostly by pleasure craft, watched over by the statue of a seated fisherman by local artist Correna Cowie. The harbour area of the town is the main focal point as the harbour is used for a water sports club and has a big following of small yacht followers. Findochty also plays host to Friends of Moray Firth Dolphins who run pleasure trips from the harbour out into the bay.